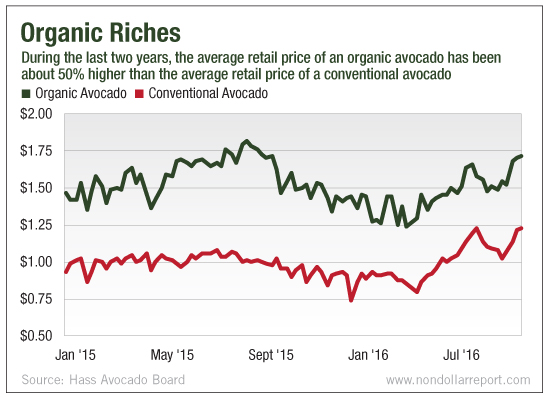 Consider why the profit margins of Whole Foods are declining. It’s not because fewer people are buying organic produce. It’s because fewer people are buying organic produce from them! Today, you can buy organic products at Wal-Mart! The market is expanding dramatically. And that bodes well for farmers, especially those who are farming in less expensive parts of the world and still meeting U.S. Department of Agriculture guidelines. The founders of Live and Invest Overseas are my local contacts on the ground. They’ve been following this opportunity since its inception and are well-versed in all the nuances. If you’re interested in diversifying your investments into organic agriculture, they’re the folks you need to contact. Get in touch here for more information.